Make A Difference One Card At A Time! Today is my sweet friend, Linda Scott’s birthday. She would have been 77 years old. She went home to heaven a few months ago where she kicked osteoporosis to the curb and is now standing straight and I imagine, sharing stories with Billy Graham and Barbara Bush. Linda loved to send cards. 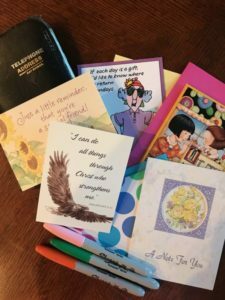 She always added her special art work and Bible verses to each manufactured card to make it a unique gift. At her funeral, one of the speakers asked how many people in the room had ever received a card from Linda. I think every single person in that room raised their hand. What a gift she had to make everyone feel special. In honor of her today, I would encourage you to give or send a card to someone to let them know how special they are to you. It can be a friend, a long-lost relative, a teacher who left an impact on your life, a co-worker, your son or daughter or spouse. It can be someone you know personally or someone you just know from afar. Whomever you choose, I know they will be blessed by your special thought and effort to reach out to make a difference. I believe Linda is smiling down from heaven today now realizing what an impact she made….one simple card at a time. This entry was posted in devotional, inspirational, motivational, spiritual on May 9, 2018 by Deanna Young.